- In a large measuring cup with a spout, add 110-degree water. Gently sprinkle in the yeast and let stand for 5 minutes, until the yeast dissolves. Add remaining water and olive oil and stir. - In an 11-cup (or larger) food processor with the dough attachment, pulse together the flour and salt. Continue pulsing while pouring in the liquid ingredients (reserving a few tbsp). Add the reserved liquid if the dough doesn't become a ball. Process the dough about 30 seconds longer, until smooth and elastic. - Transfer the dough to a floured work surface, knead it slightly and roll it into a ball. Place dough ball into a large bowl sprayed with Pam. Cover tightly with plastic wrap. Let rise about 1 1/2-2 hours in a warmed room, until the dough has double in size. I usually turn the oven on to about 200 degrees and place the dough to rise on the oven. When dough has risen, deflate it by punching it with your fist. Divide the dough into 9 even balls. Depending on how many you want to make, you can either place some doughs individually in freezer bags and freeze, or roll dough out (see below for tips on rolling it out) and bake your flatbread immediately. Makes dough for 9 flatbreads. - Preheat oven to 500 degrees, with baking stone inside, on the lowest rack for 40 minutes-1 hour. The bottom of the flatbread won't crisp and will stick if the stone isn't hot enough. - Roll out each flatbread dough on a well-floured pizza paddle. Use a rolling pin so that the dough becomes 1/4-inch thick. The beauty of flatbread is that it can be any shape, so don't worry about creating a perfect circle. While you are rolling out one dough, keep the others covered with plastic wrap so they don't dry out. - Carefully, transfer the flatbread from the paddle by tipping it gently to the heated baking stone. Bake for about 2 minutes or until just slightly crisp on the bottom. Remove from oven using the paddle and sprinkle on the asiago cheese, then top with prosciutto (cover completely because the prosciutto will curl up when cooked). Place back in the oven for about 3 minutes, or until crisp on the bottom and just slightly browned on the top. Remove from oven, drizzle lightly with olive oil and sprinkle wiht sea salt and fresh pepper. 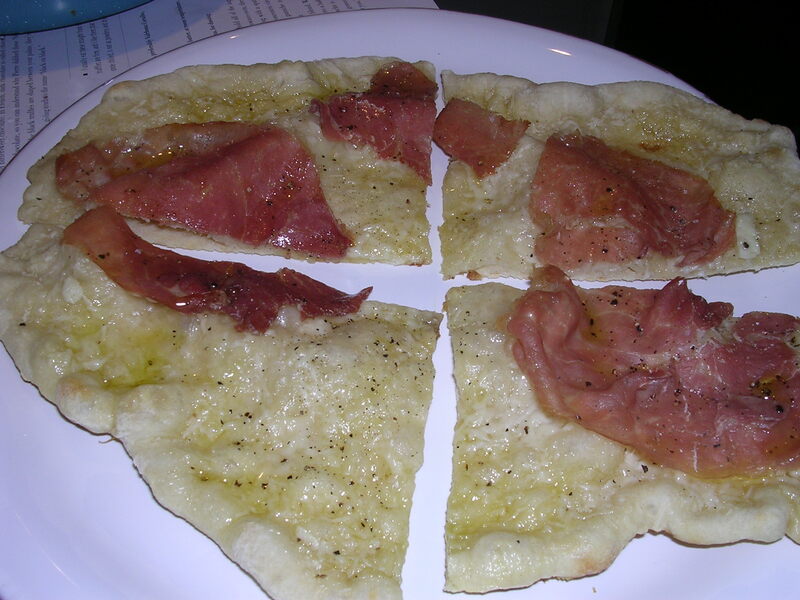 - Cut into 4-6 slices using a pizza cutter or sharp knife. Serve warm. Each dough serves about 2. Repeat with remaining dough.